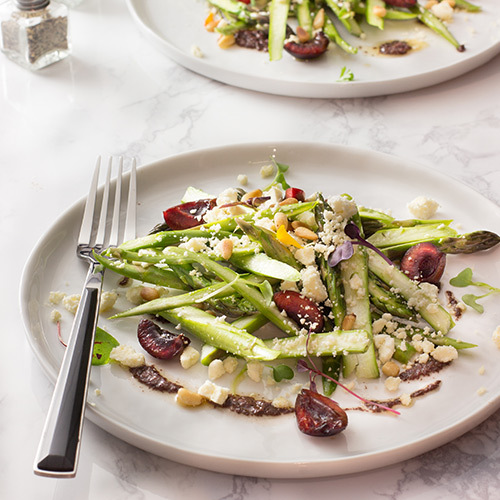 Diagonally shave or thinly slice asparagus and toss with 1 tablespoon olive oil, fresh lemon juice and Feta. Toast pine nuts on a parchment-lined baking sheet for 5 minutes at 350˚ degrees until lightly browned. Let cool. Add to asparagus. Quarter cherries and add to salad. Puree kalamata olives and 1 tablespoon olive oil in blender. Drizzle on side of dish.